Tipsy Toes | Main | Who Needs Matching Shoes? The Sockapaloooza socks will shortly be winging their way to their intended recipient. I gave them one last stroke and pat before packing them away with a few other little goodies. I need to mail them today because my chances of actually getting to a post office on Tuesday are non-existent. I hope my sockpal enjoys them. I hope they fit! This is the African violet that sits on my desk at work. It blooms almost constantly since I moved to this location. It really loves the morning sun through the window. I’m getting better at capturing the color with my camera. I did photoshop this a wee bit — but only to shift the color back towards red a tiny amount. The camera shifts towards blue. The little specks that almost look like digital camera noise are, in real life, the most amazing multicolored metallic sparkles. I defy any camera to capture them. 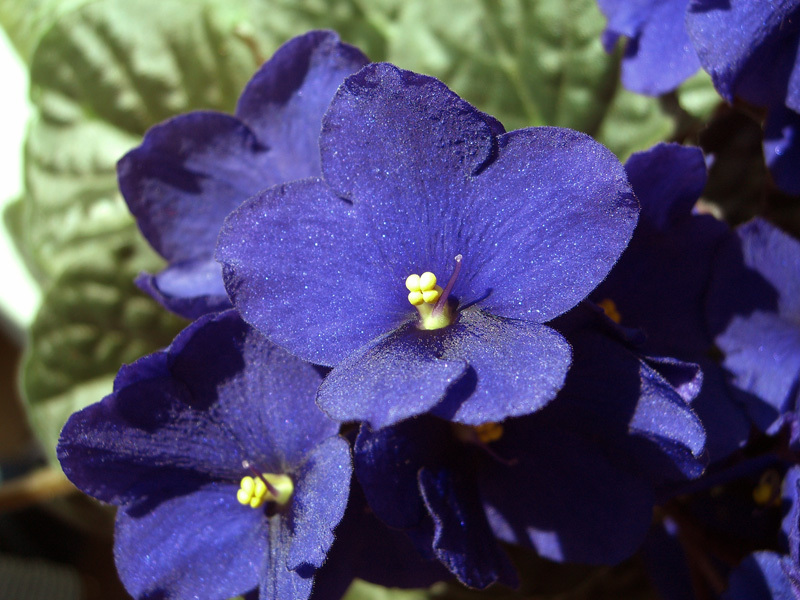 The socks are almost the deepest purple color around the edges of the violet petals. Today I get my clock! Yea! I will finally know what time it is again. Yea! #1 Son called last night. He and his cohorts have crossed the border into Canada. If all goes well they should arrive in Anchorage by next Thursday. He has promised to keep in touch. Think good thoughts. Oh no, too bad they were not turned back at the border. We will keep him in mind, (worried mom) And I like how my embossed leaves are turning out – but I shifted the increases on the star toe to better fit the pattern. And I like the pattern better in a more monochromatic yarn – like the Olivenite I did the first pair in. I liked the way you shifted the increase to match the leaves. I’ll probably do that too — next embossed leaves attempt. I’m considering going the opposite way and using some really, really bright colors. The Red Rock Canyon stopped pooling and started spiralling. Even the pooling actually looks pretty cool with this stitch pattern. And thanks for your good thoughts. There are some bad places still in the road, but I’m hoping they won’t do anything too foolish.